Now 5 to 6 players can explore Catan's wild unknown seas in search of fish, spices, or rich new lands for settlement! This Catan: Explorers & Pirates 5-6 Player Extension allows you to add 1 or 2 new opponents without sacrificing ease of play. As in the Catan: Explorers & Pirates expansion, you'll build harbour settlements, ships, settlers, and crews and set out across mysterious seas in search of new lands, spices, fish, and gold fields. So, get a team of 5 or 6 together for an adventure in Catan. Challenge pirates on land and sea as you seek to win renown. Use your ships to carry loyal settlers and claim faraway territory. Chart unknown waters and return with rich cargo. Should you prove the most able explorer and be the first to complete your noble mission, you'll become master of Catan! 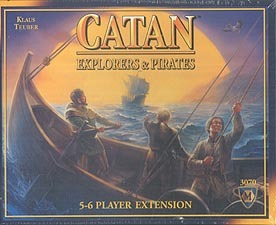 You must have The Settlers of Catan game, Catan: Explorers & Pirates and The Settlers of Catan 5-6 Player Extension in order to play with this extension.